, a big city where time has almost forgotten these Soviet-era cars and homes. with dome-shaped churches that almost resemble mosques – the Baroque style of architecture. taking in the traditional architecture and modern way of life; a blend that can perhaps be found only in Romania. 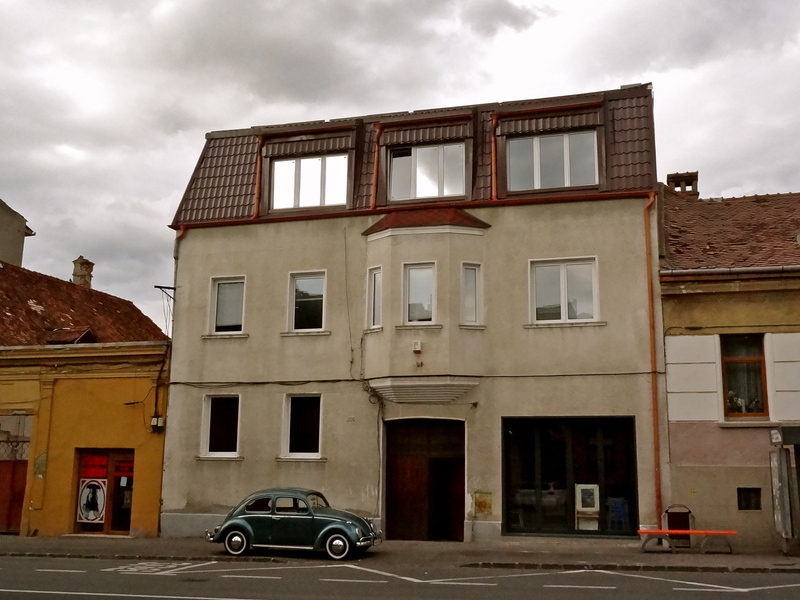 in a restored 100-year-old house called Casa Matei in Brasov. called Bistro del Arte, in the old town of Brasov. available everywhere in Romania. Orthodox Catholics in the country observe a vegan fast twice a week or for 6 weeks before Christmas and Easter, so every local resto offers marcare de post (fasting menu) featuring veggie dishes without eggs or dairy. This zakuska (dips of mushroom, eggplant and beans) was a real treat. with dinner in a wine cellar and a live violin performance. caught on a train ride through Transylvania. 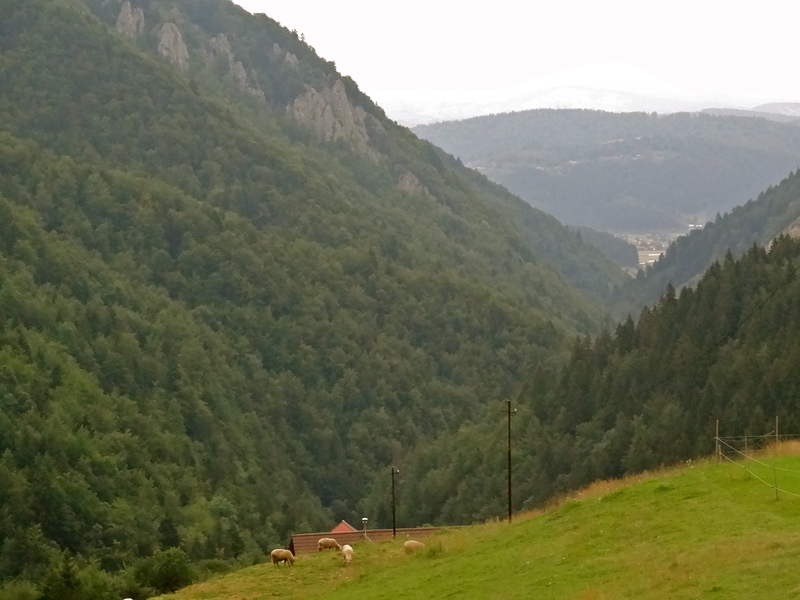 a glimpse of the Romanian countryside, in the charming mountain village of Magura, located within a national park. as though we’ve time-travelled, and not merely taken a train an hour from Brasov. where sheep breeding is the primary occupation, men still use scythes to cut grass, and people collect hay in the summer to feed their cattle in winter. Yet, everyone has modern cars and traditional houses equipped with central heating and other urban comforts. ; our attic in the village home of a Romanian family in Magura. Has Romania made it to your wish list yet? Join me on Facebook, Twitter and Instagram for live updates and stories from Romania. Nice to see glimpses of a country which in general is not a part of Europe tour packages. Ugggghhh. Your awesome blog updates frustrates me. Because I’m stuck. In the corporate world that you quit! I would have never read about Romania in detail if I hadn’t read your blog 🙂 Keep posting and can you share the camera and lens you use ( hope it’s not too much to ask for 😛 ) . Fascinating to see Europe in this way! I didn’t expect the horse cart still in use, or hay being gathered by scythe and pitchfork. Why do the Romanians work without petrol? Is it for the sheer joy/pleasure, because it’s inexpensive/economical, for a religious reason (like the Amish in the USA), or environmentalist? Or some other reason? Thanks for the information, serban! tradition and group pride. it’s mostly part of tradition. Shivya, this is so so beautiful! I feel like am on a virtual tour with you. Shivya, what a beautiful post, through your images you document the healthy, rural live of the locals. Living in the U.S. , having moved over here 24 years ago from Germany, I really can relate to this wonderful culture, though haven’t been in Romania yet, but in Hungaria and Bulgaria, next month on my way to Germany for a wedding I will spent a few days in Krackau, Poland. I wonder what will be your next destination in Eastern Europe? Love the attic picture Shivya..
Hi Shivya, its so wonderful to see someone follow their dreams and actually live life on impulse. I came across your blog about 2 weeks back and since then, all I can think of is making my dream of living in the English countryside come true. Meanwhile, would you be able to give me an idea of the duration of your trip to Romania, and how much would it cost on an average, including travel expenses to and fro.. Amazing!! Yes, it has definitely on my wish list 😀 great photos! Beautiful images… love how you captured the essence of the country with these photos. Loved the one of you looking out of the window. The first line reminded me how I have planned some of my recent trips :). First open the map :). Nice pictures and beautiful place!! Beautiful story told through the lens. Needless to say I was transported to Romania. I had always wondered about Eastern European countries and their lush green meadows and today I experienced a glimpse of it. Tell me one thing Shivya is Romania trip super expensive or one can fit it in a doable budget. I’m planning to go to Romania in November. Can you give me some details on the Romanian tourist visa? Dreams are made up such stuff! Bewitching indeed! This is another shot in the arm for the Vagabondian spirit contained inside me. Added to my bucket list. Thanks Shivya Nath! Nice post Shivya – Romania’s always been somewhere on my “places to go” list but it’s moved up a bit now. Looks really chilled. Didn’t realize you were in Romania. Very cool! Great post, as always, Shivya. Oh how I envy you! I’ve been meaning to go to Romania since I watched Top Gear episode where they go on theTransfăgărășan road. Check that out if you’ve time. Wow! What a wonderful post and photos that tell about the life in Romanian..While seeing your photos, time paused for few minutes, transcending me back into the bygone era of Eastern Europe. You have some incredible clicks. Way to go…!! Thanks Suyash; your comment made my day! I hadn’t really thought of Romania as a destination, but I’m starting to reconsider. Especially the rural areas got me interested! Your blog site is amazing! So informative and inspiring. I love the photos of the places you’ve been to. Each photo tells a story. These photos are memories to last you a lifetime. The places you have been to and are going to see need not be forgotten. I can’t wait to read more about your travels and view your wonderful photos. I would recommend you to See CROATIA…I visited last year…This would be really shock you..I have not seen any country like this…It was awesome(especially 100+ Islands)!!! I am planning Romania this year..Can you guide me which city I should stay or go there?Would be around 3 full days. Hi Shivya.Nice photos from my country.Thank You! Previous PostTravel Contest: Win an Epic Trip Through Kashmir and Ladakh! Next PostRomania, You Can Fool The World With Your Smiles, But Not With Your Heart.